Help to find your new home is just a click away. Browse our inventory and when you see one you like, simply call the listing agents phone number or shoot them a quick e-mail. We are here to serve you. We are experts in locating just exactly what you're looking for. Please let us prove to you why we are number one. Ayude a encontrar que su nueva casa está sólo un chasquido lejos. Hojee nuestro inventario y cuando usted ve el que le gusta, simplemente llama el número de teléfono de agentes de listado o pega un tiro a ellos un correo electrónico rápido. Debemos servirle aquí. Somos expertos en la localización sólo exactamente lo que usted busca. Por favor déjenos demostrarle por qué somos el número uno. Apx. 1,600 sq. ft.! Home is move in ready with Kitchen island, and eating are in the kitchen plus formal dining room!. Separate laundry room, loads of counter space. Large living room, and office or third bedroom! Very large deck runs from the front of home down the side . Low maintance, must see to appreciate. Central air forced air heat! Shed Has so many extras a plus for the new home owner! Yes this home has a garage! Very large home with great floor plan! The kitchen and family room are in the front of the home with upgraded cabinets and island! Separate laundry! Living room and dining room are in the middle of the home! Master bedroom is very big and the home owners installed a very beautiful walk in tub! Three very large bedrooms! Master bedroom is extra large! Large front deck, central air forced air heat! 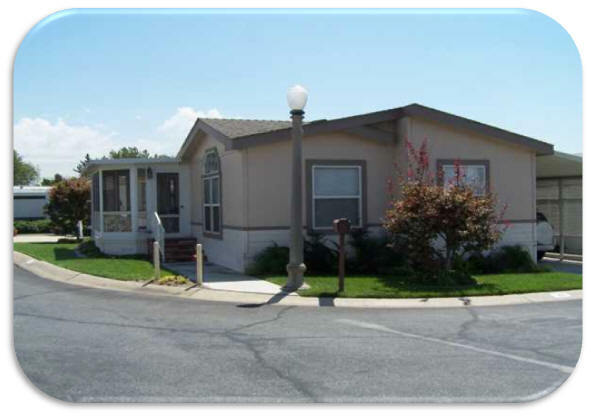 One of the most popular senior parks in the area with lot rent you can not beat! One small pet is welcome! Great home, well taken care of! Facing north viewing mountains! Many windows, front living room and dining room with hutch! The Kitchen is large and has an island!. Sliding glass door goes out from the family room to the porch. Off the porch is a cement private patio! Large family room! Separate laundry room and off the back porch is a lift! Bath room off the laundry room goes into second bedroom! The master bedroom is large with vanity and closet and garden tub. Brick steps The home will not last long so if your looking in the Alta Loma senior park call to see this home. One small pet is welcome. 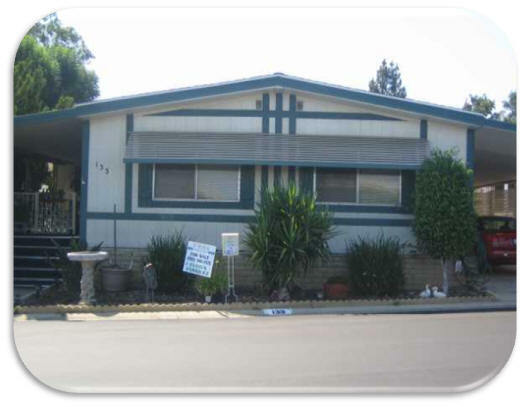 Hard to find three bedroom and family room in SENIOR PARK! In the most desirable area of Alta Loma! Big open kitchen is with the dining room between the kitchen and family room! Two bedrooms at the front of the home with second bathroom between them! Living room is off the long, long front porch! Master bedroom and bath are at the back! Two car driveway ! Small side area for garden, another patio? Home painted inside and out not long ago! Home is in move in condition...... Shown by appointment only. JUST AN ADORABLE HOME!! Immaculately clean inside and out! 2bed/bath L-shaped living room/dining room area with built in hutch, chandelier and ceiling fan/light and carpets new 3 years ago. Levelor blinds on most of the windows. Extra window for more light. Kitchen is roomy with lots of cupboards, pantry, built in brand new microwave, four burner range top, oven broiler combo, new sink and fixtures and a ceiling fan light. Family room has a ceiling light fan unit and new carpets and sliding door to porch. There is textured wallpaper throughout the house. Laundry room has access to guest bath with upgraded vanity and sink. Guest bedroom has ceiling fan light, levelor blinds, double pane windows and new carpet and can be accessed through laundry room. 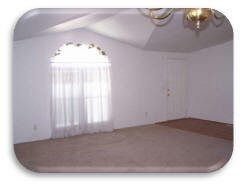 Master bedroom has pocket door entrance, new carpet, lighted ceiling fan and is kingsized plus with large closets. Master bath has new vanity, exhaust fan and $15,000 walk-in bath. Home has been retrofit for earthquakes and has brand new plumbing. Gas line has earthquake shut-off valve. Outside the unit is almost as neat and clean as the interior. There are two sheds with electricity, work benches and a small refrigerator and freezer. Space rent will be around $880. Space rent must be verified by park management. 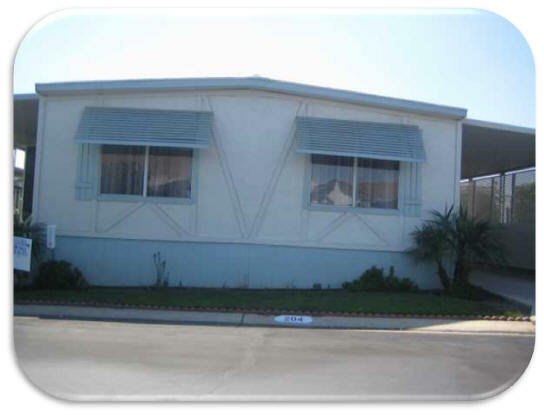 Gorgeous triple wide 2 bed/bath close to 1700 sq.ft. with cathedral ceilings throughout. 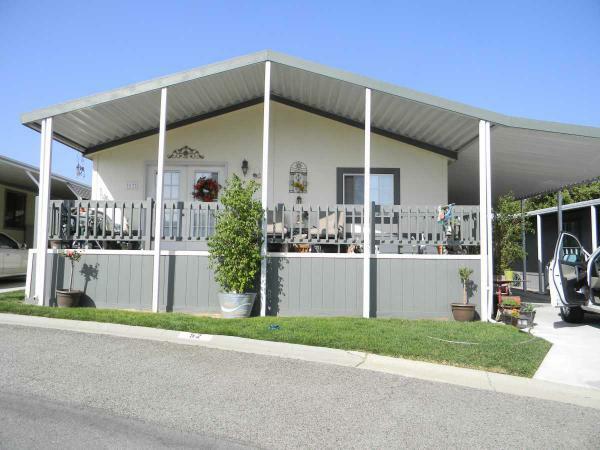 Spacious pie shaped lot with fruit trees and lots of space to garden (if that is your wish). Enter into the massive family room with cathedral ceilings and plantation ceiling fan/light. Dining room is connected to the kitchen area and bay window with view of the lovely front yard. Dining room can accommodate a very large table. It has a large built-in hutch. Kitchen is large with custom built adjustable pantry. Large laundry room with cabinets and counters to fold clothes. Hall bath is a full bath. Den is a huge separate room with double doors--could be used as office or 3rd bedroom. Master bedroom has lovely plantation style fan/light. Walk in closet is a separate room. Master bath has garden tub. Front, side and back yard with palms and fruit trees! READY FOR MOVE IN-- 2 BEDRM- 2 BATH- TAPE-TEXTURE T/O-DOUBLE PANE WINDOWS-LAMINATED WOOD T/O EXCEPT IN THE KITCHEN AND LAUNDRY RM-- FRONT DINING ROOM WITH BAY WINDOW-CATHEDRAL CEILING-FRONT LIVING- KITCHEN HAS NICE COUNTER SPACE AND PLENTY OF CABINETS-ALL APPLIANCES WILL STAY- COZY DEN- GUEST BATH HAS A WALK IN SHOWER--GOOD SIZE 2ND BEDROOM-CABINETS OVER THE WASHER & DRYER WHICH WILL STAY--ENCLOSE PORCH- NICE SIZE MASTER BEDROOM WITH SMALL WALK IN CLOSET- MASTER BATH HAS SEPARATE TUB AND WALK IN SHOWER WITH GREAT LINEN CABINETS-CENTRAL AIR & FORCE AIR HEATING--NEW ROOF-- CORNER LOT WITH VIEW OF MNTS FROM FRONT PORCH-2X4 CONSTRUCTION- A MUST SEE HOME . 3 BEDROOM- 2 BATH ROOMS- FIREPLACE IN LIVING ROOM- NICE DINING ROOM WITH BEAUTIFUL BUILT IN HUTCH- OPEN KITCHEN AREA- HAS AREA FOR SMALL EATING AREA- ALL APPLIANCES TO STAY WITH HOME-BULIT IN DESK- NICE SIZE DEN- 2 FRONT BEDROOMS- GUEST BATH HAS A TUB AND SHOWER COMB-MASTER BEDROOM AT REAR OF HOME-GOOD SIZE MASTER BATH- WITH WALK IN CLOSET- SEPARATE TUB AND SHOWER-CENTRAL AIR AND HEATING-CATHEDRAL CEILING-LOW MAINTENANCE YARD . READY FOR MOVE IN-CHARMING 2 BEDROOM-1 BATH IN A 55+ SENIOR LIVING-NEWER CARPET T/O EXCEPT IN THE WET AREA-NEWER LINO IN KITCHEN AND BATH ROOM-NEWER DISHWASHER--ALL APPLIANCES WILL STAY WITH HOME--REFIGERATOR & WASHER AND DRYER- SS SINK-NEW COUNTER TOP IN KITCHEN-PAINTED INSIDE AND OUT-NEW LGHT FIXTURES T/O- LOW MAINTENANCE LANDSCAPING- CLOSE TO GUEST PARKING AND CLUBHOUSE- CENTRAL AIR-SHED. Nice 3-bedroom 2-bath home -Two front bedrms -guest bathroom is a good size with tub and shower combo -large living room was sliding door going out to front porch -laminated wood throughout the whole house except in one of the front bedroom- Den area is open to the kitchen which has good cabinet and counter space -all appliances will stay with the home- refrigerator -washer and dryer -microwave- utility room has nice cabinets over washer and dryer -master bedroom is a good size and master bathroom has a walk in handicap shower--Central air forced & heating--home has full awnings on both sides carport & porch-- sellers are going to have a new roof installed-- low maintenance yard-- nice view of mnts . Beautiful 3/2 custom built in 2005 has added features like multiple dormers (skylights) and built in hutches.On entering the unit, you are immediately impressed by the space. The L shaped living and dining room is very bright and cheerful and the family sized kitchen is spacious and bright also. Huge family room has two large windows. All the bedrooms are large with oversized closets. 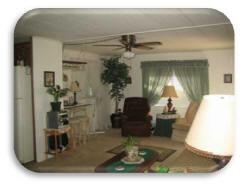 There are ceiling fans in the dining room, kitchen, family room and master bedrooms. GREAT LOCATION IN THE PARK- READY FOR MOVE IN-VERY OPEN FLOOR PLAN-NICE SIZE LIVING ROOM-FORMAL ENTRY WAY WITH TWO BUILT IN CORNER HUTCH - GUEST BEDROOM IS AT THE FRONT OF THE HOME AND IS CONNECTS TO THE 2ND BATH ROOM- FORMAL DINING ROOM - COZY DEN AREA- GREAT KITCHEN -PLENTY OF CABINETS AND STORAGE SPACE- BREAKFAST BAR & PANTRY AREA-REFRIGERATOR-RANGE-DISHWASHER-WASHER & DRYER HOOK UP WILL STAY WITH THE HOME SALE-GREAT SIZE MASTER BEDROOM WITH MIRROR CLOSET DOORS- MASTER BATH ROOM HAS DUAL SINK-SEPARATE GARDEN TUB AND SHOWER-THERE'S A GREAT PORCH WITH A WROUGHT IRON GATE - CENTRAL AIR-SHED- FIVE STAR SENIOR COMMUNITY . 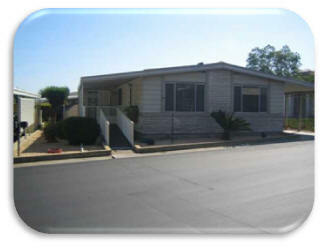 Nicely landscaped well maintained unit in award winning mobile home community in the very popular area of Alta Loma. Home has a large deck area with retractable shade screens. 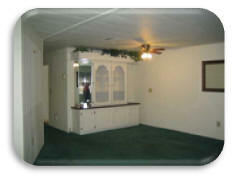 Bright L shaped living room/dining room including a built-in hutch with lit glass doors to show off your collectables. Lovely kitchen looking over a breakfast bar, laminate floors, dish washer, double oven and newer sink and faucet. First bedroom has large closet with space saver hardware. 4 piece guest bath off hallway has laminate floors. Master bedroom is spacious with a large walk-in closet, high windows for privacy, master bath has large shower stall, laminate floors. Automatic sprinkler system for beautiful landscaping, spacious shed for storage, extra storage under deck, air conditioner works great! . Lovely peach tree in back. GREAT PRICE - 2 BEDROOMS- 2 BATHS- GREAT FOR A SINGLE PERSON OR A COUPLE--NICE VIEW OF THE MOUNTAINS--SMALL YARD WITH A FRUIT TREES--ALL APPLIANCES WILL STAY WITH THE HOME- WASHER AND DRYER-REFRIGERATOR-DISHWASHER-CENTRAL AIR-FRONT LIVING ROOM- DINING ROOM-- CUTE KITCHEN-WITH LOADS OF CABINETS- BEDROOMS AT REAR OF HOME. ACROSS THE STREET FROM NEW WALMART SHOPPING CENTER--WELL KEPT HOME- FRONT LIVING ROOM WITH DUAL PANE WINDOWS- DINING ROOM WITH BUILT IN HUTCH- OPEN FLOOR PLAN-DEN IS A GOOD SIZE WITH SLIDING DOOR GOING OUT TO FRONT PORCH--NICE KITCHEN WITH PLENTY OF CABINETS AND LOADS OF COUNTER SPACE-ALL APPLIANCES HAVE BEEN REPLACED AND WILL STAY WITH THE HOME--LAINDRY ROOM HAS BUILT IN CABINETS--MASTER BEDROOM IS AT REAR OF HOME AND A GOOD SIZE- MASTER BATH HAS SEPARATE GARDEN TUB AND SHOWER- GUEST BEDROOM NICE SIZE- AND GUEST BATH HAS A TUB AND SHOWER COMB-NEW HEATING AND AIR CONDITIONING- WATER HEATER WAS REPLACED APPROXIMATELY 3 YRS AGO--ARTIFICIAL GRASS IN THE FRONT OF THE HOME . THIS IS A LARGE HOME WITH AN ADD-ON ROOM THAT OPEN UP TO THE LIVING ROOM--3 BEDROOMS-2 BATHS- PAINTED INSIDE T/O-NEW CARPET-NEW LINOLEUM IN KITCHEN AND LAUNDRY ROOM- KITCHEN HAS LOADS OF CABINTES AND COUNTER SPACE-ALL APPLIANCES WILL STAY WITH THE HOME- WASHER AND DRYER-REFRIGERATOR-DISHWASHER-OVEN-MICROWAVE-DUAL PANE WINDOWS-WATER PURIFIER SYSTEM T/O HOME-THIS HOME IS HANDICAP FRIENDLY WITH WALK IN SHOWERS-TOILETS AND GRAB BARS-GOOD SIZE MASTER BEDROOM AND MASTER BATH-GREAT PATIO AND BACK YARD- LOADS OF STORGE FOR THE ALL YOUR HOLIDAY THINGS AND 2 SHEDS-THIS A MUST SEE HOME . Entering the home, you find yourself in a large living room dining room complex with spacious front windows for good lighting and a lighted glass door hutch. 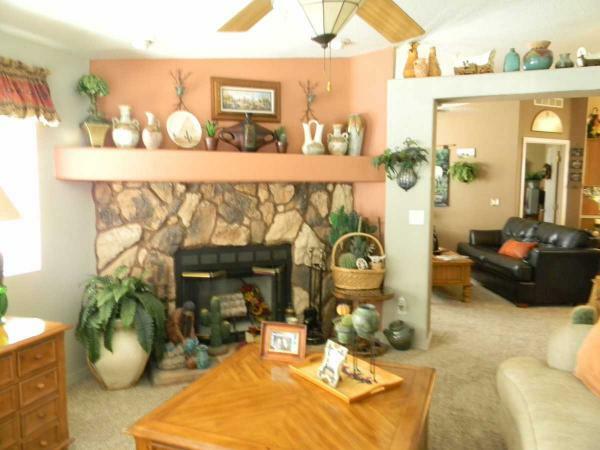 There is a faux fireplace and grey carpets and a ceiling fan over the dining area. There is a spacious kitchen with white cabinets and black appliances. There is plenty of counter space and cupboards with a walk in pantry. The den features a wet bar, ceiling fan and patio doors to the enclosed porch. The first bedroom has a queen bed and dresser set up and a large walk-in closet. The guest bath is a 3 piece off the bedroom and accesses the laundry area. The laundry has an almost brand new front loading washer and dryer and doors to the driveway and to the family room. The master fits a king size setup and features a wall to wall mirrored closet. 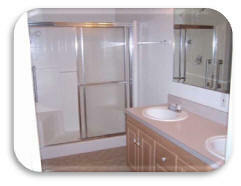 The master bath has "his and hers" sink arrangement with large mirrors and a separate tub and shower. The commode and shower are in a separate enclosure and there is a nice linen closet in the tub area. This home also has an enclosed porch (44x8=352 sq. ft) good for a hobby area or for storage. This home is very well maintained. There is a shed and parking area enough for 3 cars. Two young palm trees frame the pathway to the front door. The unit is 3 ft. longer than normal which puts its' sq. footage at1512 sq. ft. and if you combine it with the enclosed porch, it comes out to 1864 sq. ft. Outside and two units away is the access gate to the Electric Trail. The community boasts that it is the most active 50+ community in the area with year round pool and spa with gym facilities. We have billiards, bunco, darts, miniature golf, ping pong, bingo, zumba classes, water exercise, seated aerobics, just about any type of card game, community dinners, lunches, breakfasts and parties for New Year's Eve, Super Bowl, World Series, etc. One of the most social places you could live at. Enter a "dream home" with vaulted ceilings in the living room with dormer skylights and beams. It has a separate dining room with lots of light from windows. Home has engineered "distress" wood throughout except for the ceramic tile flooring in kitchen and baths. Kitchen is spacious with corian countertops and cherry wood cabinets with pull out shelving. There is a tile backsplash with inserts. A large skylight keeps the kitchen bright and cheerful. There is a mountain view from the windows over the sink. It has stainless steel appliances---fridge, stove, dishwasher, and microwave. There are three bedrooms with the MB having a door to the patio. The roomy master bath has his and her sinks with a Jacuzzi tub. GREAT HOME IN 5* ADULT PARK --VERY NICE FLOOR PLAN--- FRONT LIVING ROOM--FORMAL DINING WITH BUILT IN HUTCH--NICE SIZE DEN WITH BUILT IN DESK---- KITCHEN HAS LOADS OF CABINETS AND COUNTER SPACE AND BREAKFAST BAR- ALL APPLIANCES WILL STAY--SLIDING DOOR GOES OUT TO THE ENCLOSE PORCH---SEPARATE LAUNDRY ROOM WITH WASHER AND DRYER---GUEST BATH ROOM HAS A WALK IN SHOWER---GOOD SIZE GUEST BEDROOM---MASTER BEDROOM IS LARGE ENOUGH FOR A KING SIZE BED AND PLENTY OF CLOSET SPACE ---MASTER BATH HAS A SEPARATE WALK IN SHOWER AND GARDEN TUB--- GREAT SIZE. LOW MAINT YARD--- ACROSS FROM GUEST PARKING---HOME HAS CENTRAL AIR AND FA HEATING. EXCEPTIONALY WELL TAKEN CARE OF HOME! MANY NICE UPGRADES IN KITCHEN WITH NEW 5 BURNER STOVE.....AND CLEAN CLEAN CLEAN! HOME WAS PAINTED INSIDE NOT LONG AGO. C/A HAS NEW MOTOR INSTALLED 2 YEARS AGO, NEW HOT WATER HEATER 3 YRS. AGO. PRIVICY SLATS ON BOTH SIDES OF HOME! CATHERIAL CEILINGS IN LIVING ROOM, HOME IS VERY OPEN WITH LARGE FAMILY ROOM AND LARGE LAUNDRY ROOM.. NEW $400 SECURITY BACK DOOR! LARGE SHED AND VERY NICE LANDSCAPED BACK YARD. BUT LET ME TELL YOU, THE NICE EXTRA WITH THIS HOME! THE PORCH IN ENCLOSED AND MAKES A GREAT EXTRA ROOM WHICH THE HOME OWNERS ENJOY YEAR ROUND. This home is move in ready! So cute! Three bedrooms with on suite in master and master bedroom also has walk in closet! Seperate laundy room Washer and dryer are negotiable.Living room and dining room in the front of home. Kitchen is very nice with pass through into dining room. You will love the kitchen! 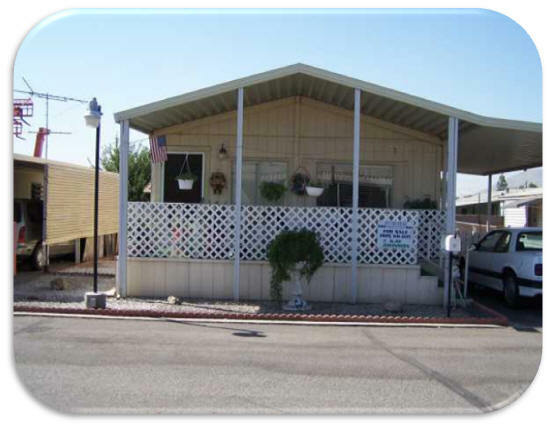 2001 Skyline Mobile Home 2Bed 1.5Bath, 1,320 s.f. This home sets on a corner with beautiful easy care landscaping...It is very open, with Dormer window in living room, parquet kitchen floors and entry. Has a third room for office or bedroom with double doors. And one striking thing about this home is it has a glassed veranda out of the front door which feels like it ads more space. 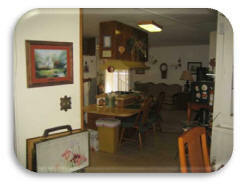 Lovely area to sit and faces the mountains...Central air washer dryer, oven, microwave and refrigerator are included. It's a great buy for newer home and good space rent at the park. WE HAVE A FINANCE OFFICE. Take a look at this home, corner lot, close to guest parking!Large living room with many windows! Dining room, coat closet! Over sized laundry room with loads of cabinets and storage, second bath off the laundry room with shower.Laminate flooring in family room which is open to good size kitchen . Off the family room there is a nice enclosed porch, giving you extra room for hobbies, sewing?Second bedroom is nice size, master bedroom has plenty of closets across one wall, and on suite...garden tub, and separate shower! Central air, forced air heat, two car parking. 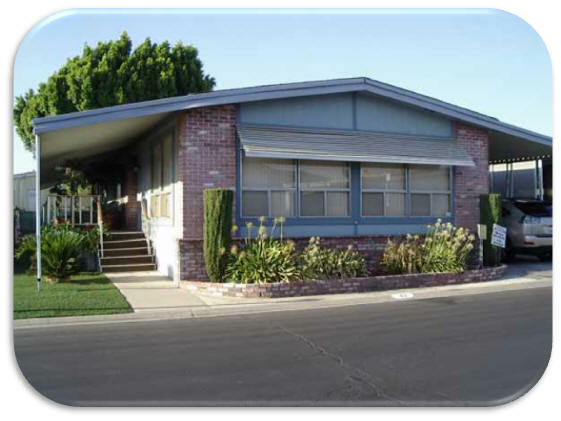 Location is great with Wal-Mart with in walking distance and Rialto Senior Citizen center across the street! 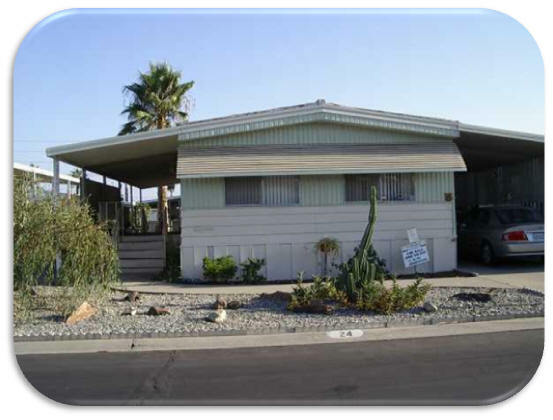 CUTE HOME-3 BEDROOMS 2 BATH--LARGE LIVING ROOM WITH DINING ROOM, ALL APPLIANCE TO STAY REFRIGERATOR- WASHER AND DRYER, CENTRAL AIR, FA HEATING. GREAT PATIO AT REAR OF HOME. Rare find! Senior park in Alta Loma 2002 Skyline.three bedrooms, master bedroom and one bedroom is oversized with sitting area. This kitchen is to die for! You could cook all day here with newer appliances and island.The front has a wonderful porch across the full front with double doors into the living room which has a fireplace! Five ceiling fans, all new sink fixtures, new ceiling lighting, skylights, central air, just too much to tell you about, sooooo give me a call and lets take a look! Large Master Suite and Bath Room. Three Ceiling fans, Two Skylights in Kitchen and Family Room. Newer Carpet in Living Room, Tile in Family Room, Roof was Replaced in 2000. All Appliances To Stay with Home. Automatic Sprinkler Front, Side and Rear Yard, Fenced Yard with Patio Cover. SELLERS ARE OPEN TO ALL OFFERS! 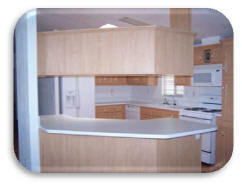 Circular Kitchen w/ Breakfast Bar, Plenty of cabinets, walls are painted white. T/O. Central air, furnace was new in 2007, Roof was replaced in 2002. Home was re-leveled & new piers & pads in 2004. Plumbing new in 2005. close to Malls and Freeways 210, 10, & 15. Really a home you wont' see anywhere else...This has style. The family room is in the front of the home and is very large with kitchen open into it, really different. 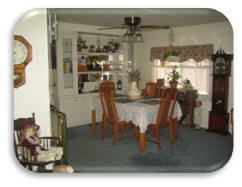 Formal dining room, and living room are in the middle of home with the two bedrooms in the back. More homes should be designed this way. Walk to club house with pool and Jacuzzi plus this park has a dry sauna. Don't see that any more and a picnic covered patio by the pool. The home also has low maintenance yard with the new no water, or mow grass...call to see today! 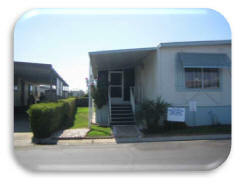 Across From Clubhouse and Guest Parking, small yard for your two small pets. Very open floor plan. Front Living Room, Dining Room w/Built-in Hutch. Den w/Slider Going Out to Front Porch. 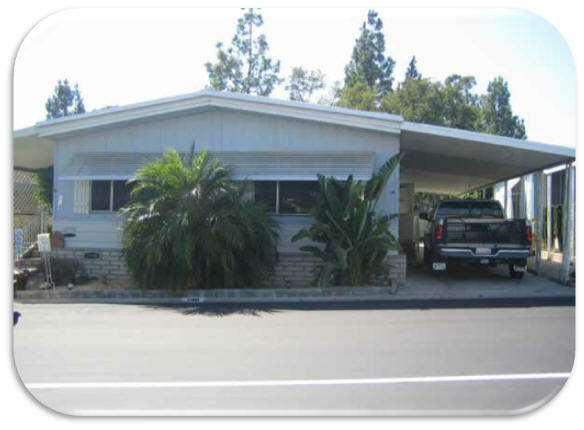 Park is Close to Malls, Shopping Center,210,10,15 Freeway. Two Nice Sized Bedrooms. 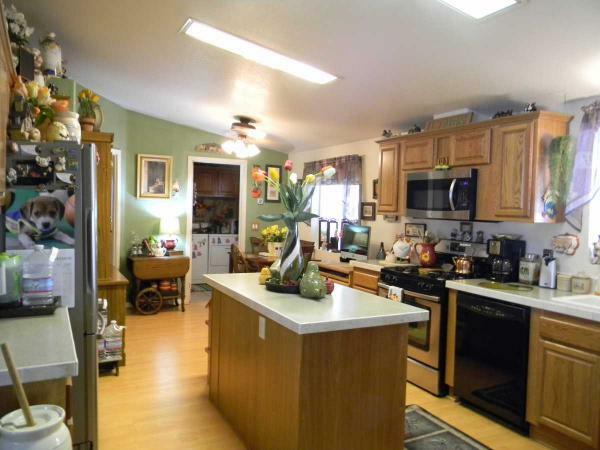 Island Kitchen w/plenty of Cabinets space, Tile Floors, Big Den Area w/plenty of Sunshine Coming in. This home has a Newer Roof, Central Air and Heating, New Plumbing T/O under home. Seller will look at all offers. WOW GREAT HOME, FACING NORTH. TWO FRONT BEDROOMS AND GUEST BATH WITH TUB AND SHOWER COMB, UTILITY ROOM WITH WASHER AND DRYER HOOK-UPS, PLENTY OF CABINETS AND ROOM FOR A FREEZER, GREAT KITCHEN WITH LOADS OF CABINTETS AND PANRTY AND GREAT COUNTER SPACE. MICROWAVE OVER THE OVEN. BREAKFAST BAR, REFRIGERATOR AND WASHER AND DRYER ARE NEGOTIABLE. SEPARATE DEN WITH TWO WAY FIREPLACE, LIVING ROOM , FORMAL DINING ROOM, MASTER BEDROOM AT REAR OF HOME , NICE SIZE CLOSET, MASTER BATH HAS DUAL SINK , SEPARATE SHOWER AND GARDEN TUB ITS A GOOD SIZE. Home is secluded and set on a corner, and its fenced! Very big living room and dining room with lots of windows. Loads of storage space and cabinets. The kitchen is big and nice counter tops. 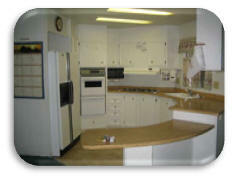 The washer, dryer, refrigerator, disposal and stove stay with the home. Central air is a plus! Good management and activities in the Senior Park...Also close to hospital, Wal-Mart, State Bros. Senior Center across the street and on the bus line. Pool clubhouse, dry sauna, Jacuzzi, patio covered are with picnic tables in the back of clubhouse by pool. The Champion brand is the most widely known name within a stable of thirteen subsidiary companies owned by Michigan-based Champion Enterprises, Inc., the third-largest MH builder in the country. Historically, until Clayton Homes' recent expansion, Champion was the industry's 800 lb. gorilla, at one point comprising 16 HUD-code home brands built in 64 plants in 16 states. Today, the Champion brand of homes are sold in all states except Florida, built in plants serving regional markets with a wide variety of floor plans and styles. 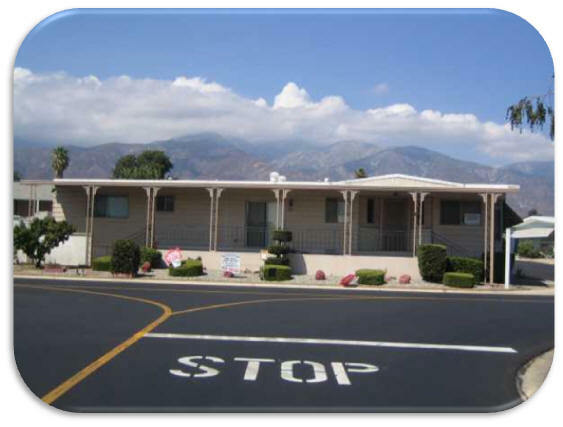 Much more about this manufacturer, including its construction quality on a one-to-ten scale and the states where its homes are sold, can be found in The Grissim Ratings Guide to Manufactured Homes, the latest edition of which is now featured in our bookstore. 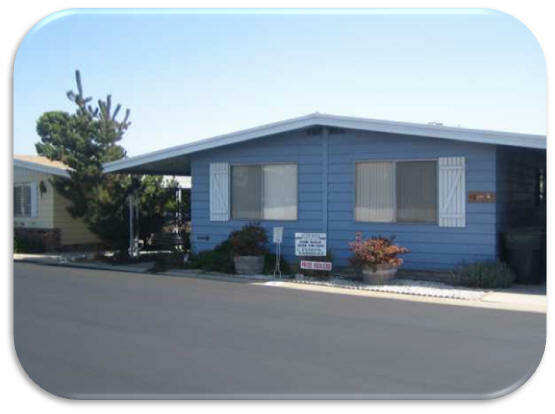 Written by veteran journalist and consumer advocate John Grissim, the Ratings Guide is widely considered the most complete, authoritative, and reliable source of independent information on manufactured homes. 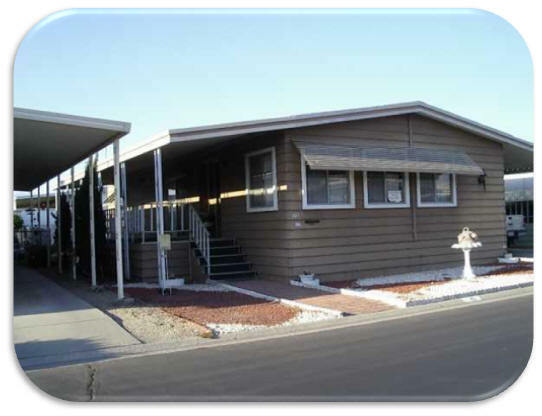 Please visit our bookstore for more about the Grissim Guides, the bestselling consumer books in America on manufactured homes. Nice open floor plan. Kitchen is good size with built in table and seating...Lots of extra cabinets and extra counter top space in the laundry room. Park is SENIOR and close to Wal-Mart and sown the street from Stater Bros. 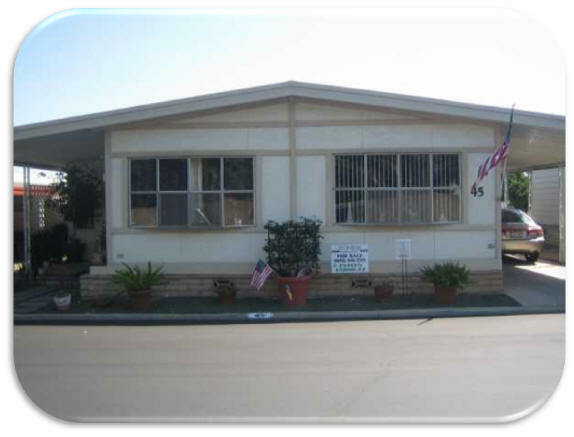 The senior center is across the street and park is on the bus line and close to the 10 freeway and the hospital. 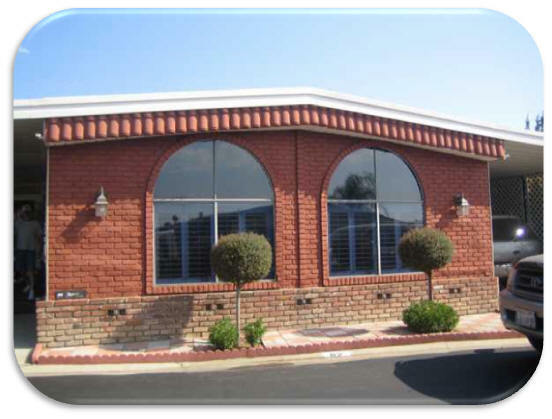 We could not match this home's manufacturer with any in our database. This could be because of a misspelling or that we do not have a review for them. For complete reviews of 83 manufacturers, view the Grissim Guide. Large Front Living Room with plenty of sunlight. Dining Room with built-in hutch. New carpet (blue) T/O. Great Kitchen with lost of cabinets and small breakfast bar, refrigerator, range, dishwasher, microwave, washer/dryer hook-ups. Nice sized Den, enclosed porch, small back yard for your pet or family. Very comfortable home with living room, dining room, two bedrooms and one and half baths There is a very nice patio behind the large deck and it is a good sized lot. Pergo floors, verticals. 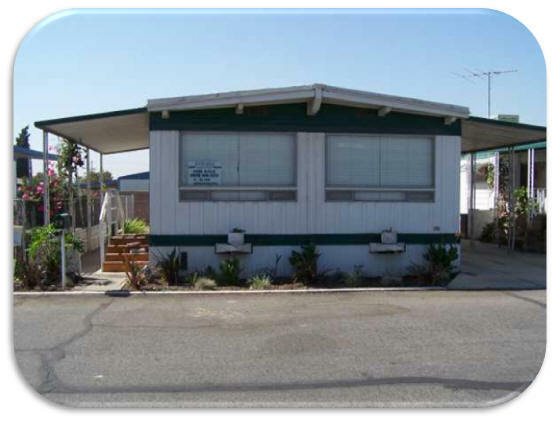 Close to Wal-Mark, Senior citizen center, hospital, & 10 freeway. Great people live in this quiet Senior Park. The Champion brand is the most widely known name within a stable of thirteen subsidiary companies owned by Michigan-based Champion Enterprises, Inc., the third-largest MH builder in the country. Historically, until Clayton Homes' recent expansion, Champion was the industry's 800 lb. gorilla, at one point comprising 16 HUD-code home brands built in 64 plants in 16 states. Today, the Champion brand of homes are sold in all states except Florida, built in plants serving regional markets states except Florida, built in plants serving regional markets with a wide variety of floor plans and styles. This home is vacant and negotiable. Very clean nice home with fenced yard and lots of room to grow veggies, flowers or put a large patio in...Kitchen was painted and home is very well taken care of...There is a light plastic siding on the car port that lets in light but gives privacy. Cute and well taken care of home. soft green new carpet, new stove, new stainless steel sink, two fans, new front door and fenced yard for the puppies! Large across the front porch and close to the 10 freeway and Kaiser Hospital...low lot rent for the space. Park is in residential area, small park but has clubhouse and pool. Don't' let the age fool ya! This home could be in "House Beautiful" magazine. Just a doll house and across fro the clubhouse. 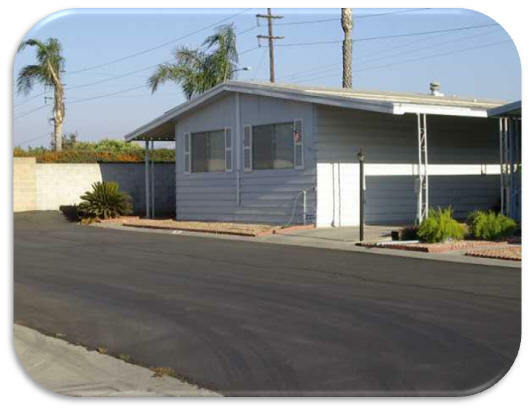 Park is small and close to Kaiser Hospital and hop skip and jump to the 10 freeway. You could walk to Stater Bros. Quiet Senior Park. Just right for retirement. Oh yes, it could be a two bedroom owner is using it for an office. Quite, with Great Clubhouse, Pool, Hot Sauna & Spa, Workout Room. 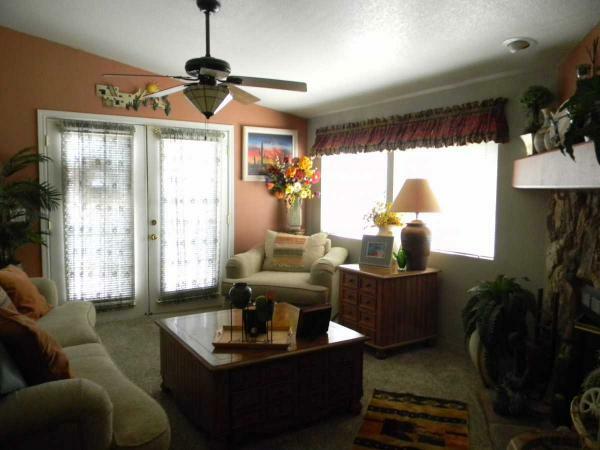 This home has an enclosed screened porch, 2 bedroom, 2 bath, spacious living room & dining room. Nice kitchen for the cook. Park is across the street from Shopping Center, close to freeway & bus stop. This Home is in 5* Senior Gated Community. Corner Lots. THIS SELLER IS OPEN TO ALL OFFER?????? This home has a great view of the mountain's. It very open with plenty of window's in the living room. Formal dining room, Island kitchen is very large & open with allot of cabinets. 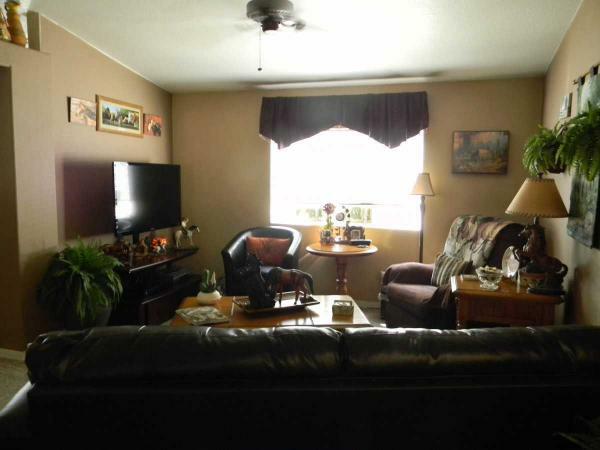 Great den with built in desk & slider that goes out to front porch.2 bedroom at end of home. newer carpet, painted inside & out. Nicely landscape, Roof is about 3yrs old Park is close to shopping, mall, freeways. Two small pets welcome. If you don't see what you're looking for, please contact us so that we may assist you. Copyright © 2008. 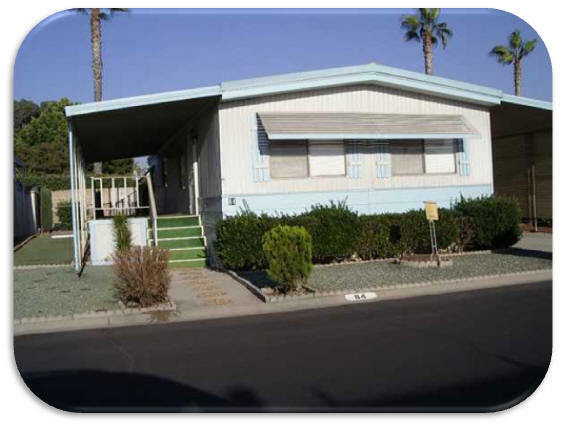 Western Heritage Mobile Homes. All Rights Reserved.